Subaru Canada highlights, in a new commercial, that the 2019 Subaru Outback can help you see the world in ways you never imagined. The 60-second spot, titled “See The World,” opens with a couple of tourists asking, in a remote country store, if the a map they found shows a specific hiking trail they are interested in. Hearing the question, a bearded old blind man tells them that they won’t find that trail on a map and offers to take them there. 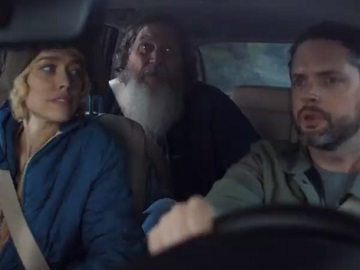 As the three people embark on the journey together, the young couple, owners of a 2019 Subaru Outback, are surprised to learn how many things their unexpected guide knows. He tells them when to turn left, when it’s the perfect moment to eat in a diner they stop by, he urges them to feel the wind on the coastline and listen in a certain way to hear the whales, and shows them his favorite part of the forest. “Our Subaru Outback lets you see the world sometimes in ways we never imagined,” the voiceover says at the end of the commercial, which also sees the tagline “2019 Subaru Outback. For life’s authentic adventures” flashing across the screen. The spot, from agency Carmichael Lynch, stars George Wurtzel, a blind artist and woodworker, as the guide and is also available with an audio description for the blind or visually-impaired.